Simon Roberts (b.1974) is a British artist-photographer whose work deals with our relationship to landscape and notions of identity and belonging. 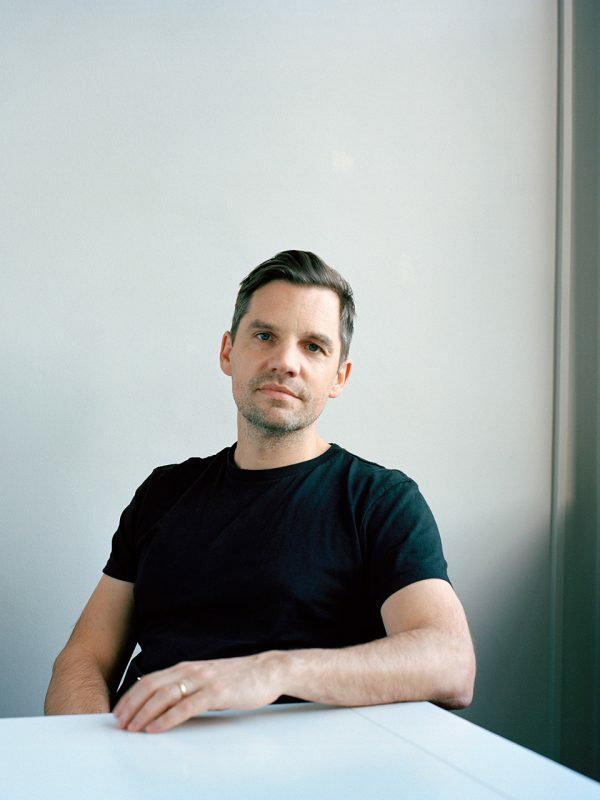 He has published and exhibited widely and his photographs reside in major public and private collections, including the George Eastman House, Deutsche Börse Art Collection and V&A Collection. 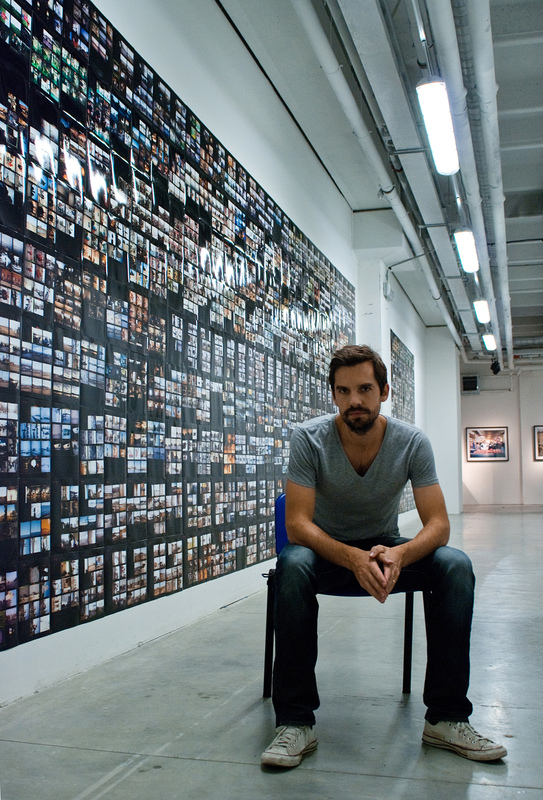 In 2010 he was commissioned as the official British Election Artist by the House of Commons Works of Art Committee to produce a record of the General Election on behalf of the UK Parliamentary Art Collection; and in 2013 was made an Honorary Fellow of the Royal Photographic Society. 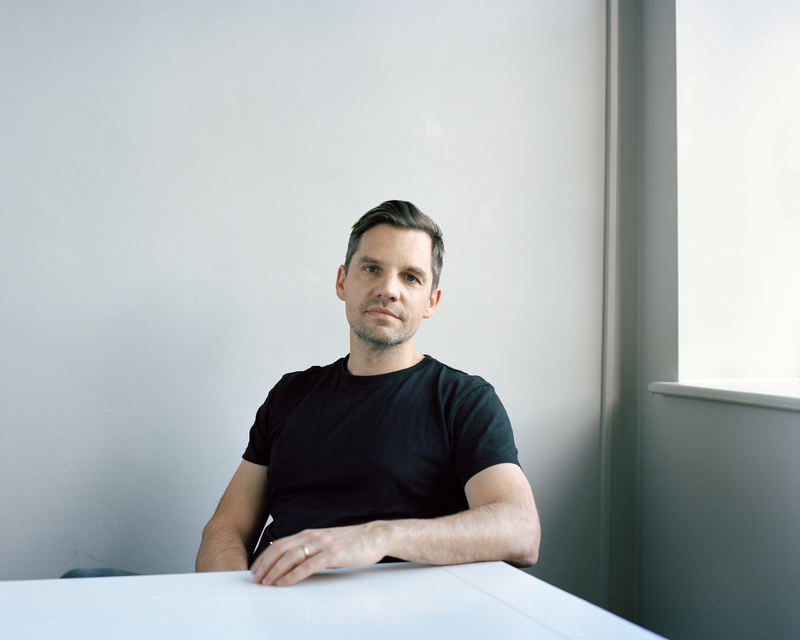 He has published four critically acclaimed monographs, Motherland (Chris Boot, 2007), We English (Chris Boot, 2009) – voted as one of the best photography books of the past decade – Pierdom (Dewi Lewis Publishing, 2013) and most recently Merrie Albion (Dewi Lewis Publishing, 2017). 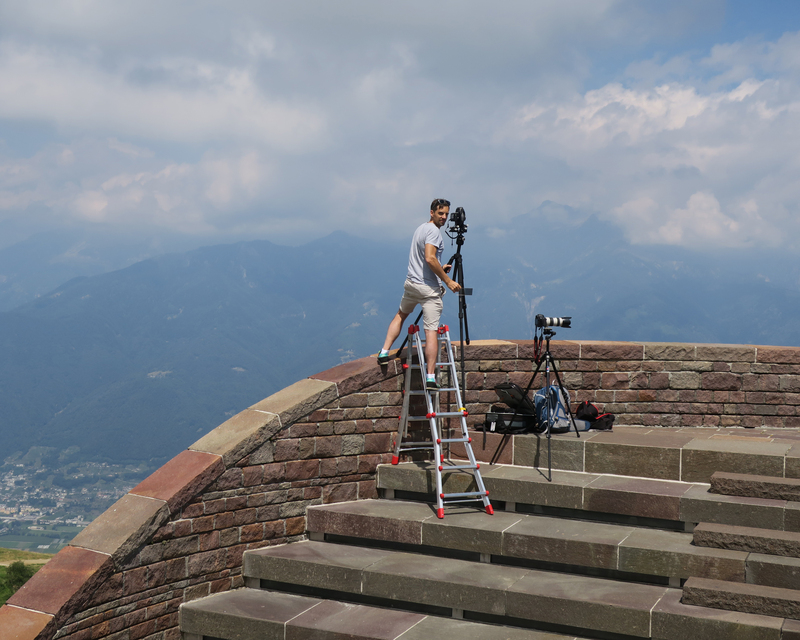 Outside of his own professional practice Simon is an active public speaker and holds a position as a visiting lecturer on the European Master of Fine Art course at IED Madrid and an Honorary Associate Professor in the Department of Geography at the University of Nottingham (2013-2019). He is involved with several not for profit organisations serving as a trustee of Photoworks and an advisor to FotoDocument. A complete resume can be downloaded here: SIMON ROBERTS CV. Portrait © Lewis Khan, 2018. For more information, interviews and downloads, please select from the drop-down menus below. New Vedute. Photographs by Simon Roberts. Essay by Emanuelle Trevi. Minimalist Works, 2019. Guardian Guide, “Exhibition pick of the week- Pierdom,” 16 January 2016. BA High Life Magazine, “Simon Roberts: social landscapes of England,” July 2015, Sufi, Noor. The Morning Star, “Show Me The Money – exhibition review,” 28 June 2014, Quille, Mike. Coast, “Pierdom – Walking on Water,” February 2014. Outside Magazine, “The Zoich Olympics,” December 2013, Funk, McKenzie. Photomonitor, “Pierdom review,” November 2013, Atwell, Oliver. Slow Wear Journal, “Victorian Remains,” 18 November 2013. Amateur Photography Magazine, Book Review, 7 October 2013, Stapley, Jon. 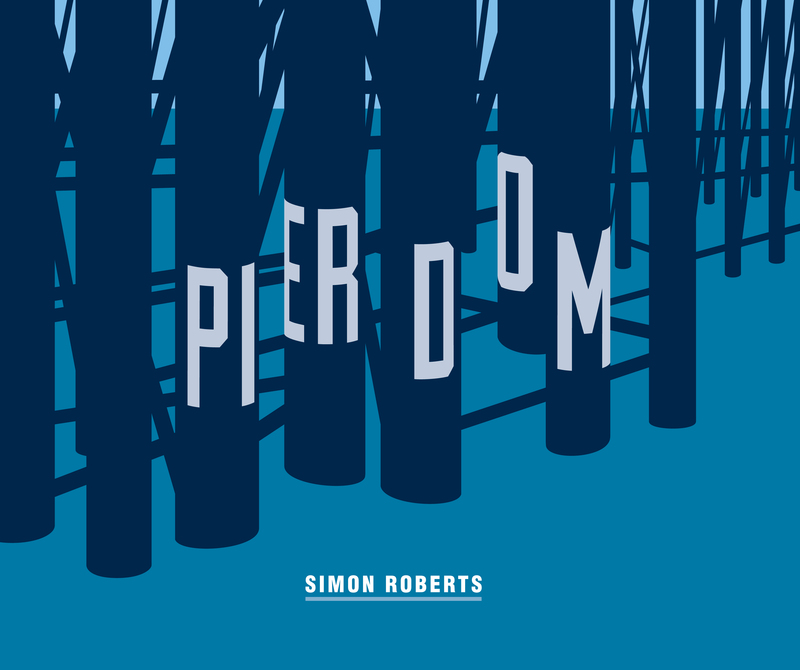 One Stop Arts, “Simon Roberts: Pierdom at Flowers Gallery,” 23 September 2013, Harbour, Stacey. Architects’ Journal, “Welcome the onset of autumn with this seaside exhibition,” 9 September 2013, Pallister, James. Camden Review, “Art Diary: Sea here,” 29 August 2013, Smith, Amy. Distorted Arts, “England Revisited,” 14 March 2013, Conery, Megan. Source, “This Is A Sign – Publication Review,” Autumn 2012, Jewesbury, Daniel. Wired, “In focus: Let this be a sign, Simon Roberts,” May 2012, Lanxon, Nate. 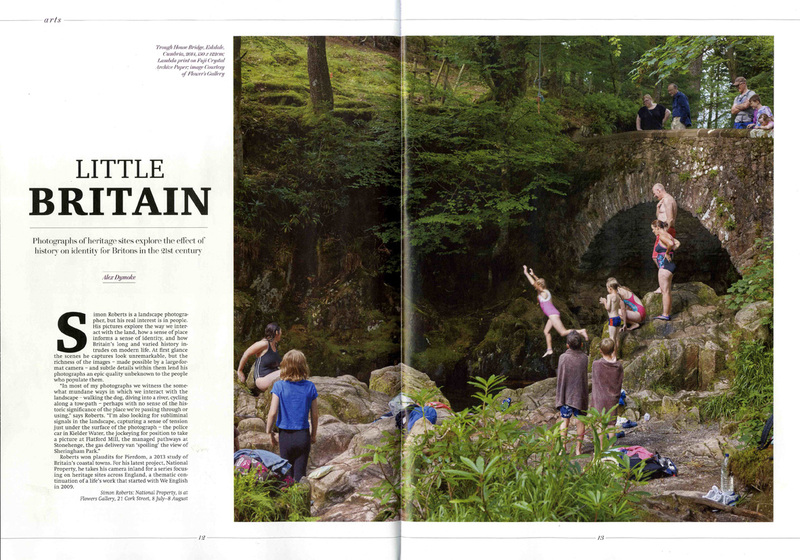 Boat Magazine, “Landscapes of Innocence and Experience,” Issue 3, Spring/Summer 2012. Creative Review, “Exhibition Listing – We English at Flowers Gallery,” October 2011. Wayneford’s Posterous, “We English: Simon Roberts extensive survey of the English at leisure,” October 12 2011, Ford, Wayne. Le Tigre, “We English,” Numero 004/ April 2011, Yogananthan, Vasantha. FT Weekend Magazine, “Britain: what lies ahead?” January 7 2011, Russell, Alec. Cura Magazine, “Motherland/Homeland,” October 29 2010. Geo, “Les Pionniers Anglais De La Vie Sans Petrole,” Issue 380, October 2010, Tugel, Hanne. Bildredaktion NZZ, “Foto-Tableau: We English,” July 5 – 9 2010, Grieder, Katharina. Photonet, “Britannia Post – The work of Simon Roberts,” Issue 134 / July 2010, Huh, Sookyoung. Surface Magazine, “Surface Geographies,” July 2010, Vasudevan, Alex. The British Journal of Photography, “Hello World: social media & photography,” July 2010, Smyth, Diane. Grafik, “Exhibition Revew – We English,” Issue 186 / June 2010, William-Purcell, Kerry. Photo Pro Magazine, “On the Election Trail”, June 2010, Hope, Terry. Total Politics, “Election 2010-A Look Back The Public’s Campaign,” June 2010, Duckworth, Ben. The Independent, “The Election Project – by the people, of the people,” May 7 2010, Duguid, Hannah. The Irish News, “Election Diary,” May 03 2010, Mcaffery, Steven. 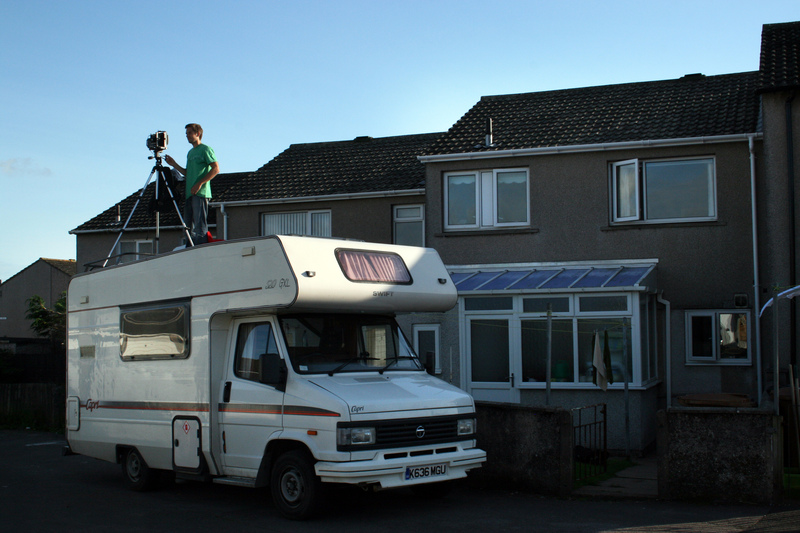 The British Journal of Photography, “We the Electorate,” May 2010, Laurent, Olivier. Professional Photographer, “On the Road: Simon Roberts Q+A,” May 2010, Weech, Kelly. 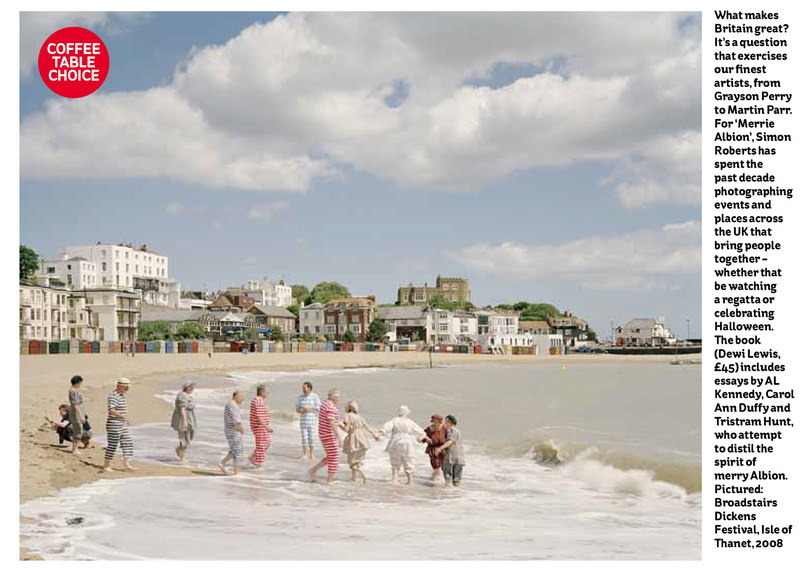 Royal Photographic Society Journal, “Simon Roberts’ Election Project,” May 2010, Land, David. Time Out London, “The Election Project – Vote with art!” April 29 2010, Ward, Ossian. 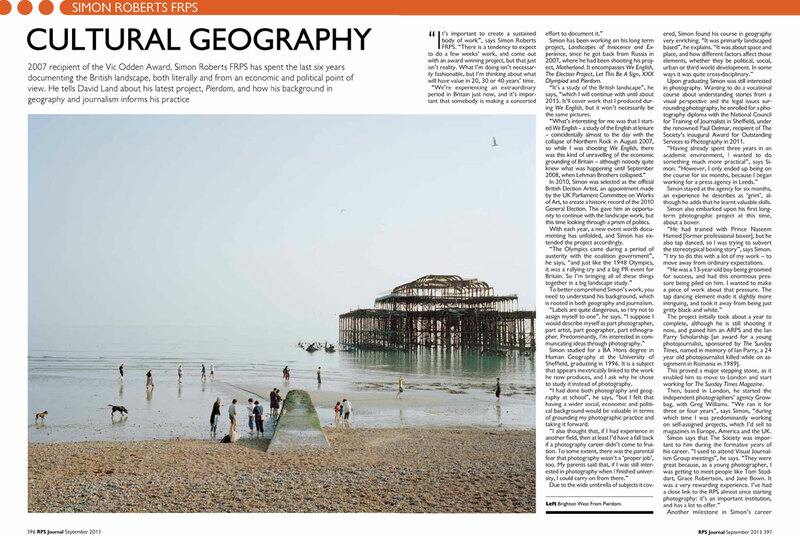 Geographical Magazine, “Simon Roberts – I’m a Geographer,” April 2010, Edward, Olivia. Outdoor Photography Magazine, “5 must-see exhibitions,” April 2010, Tanner, Aline. 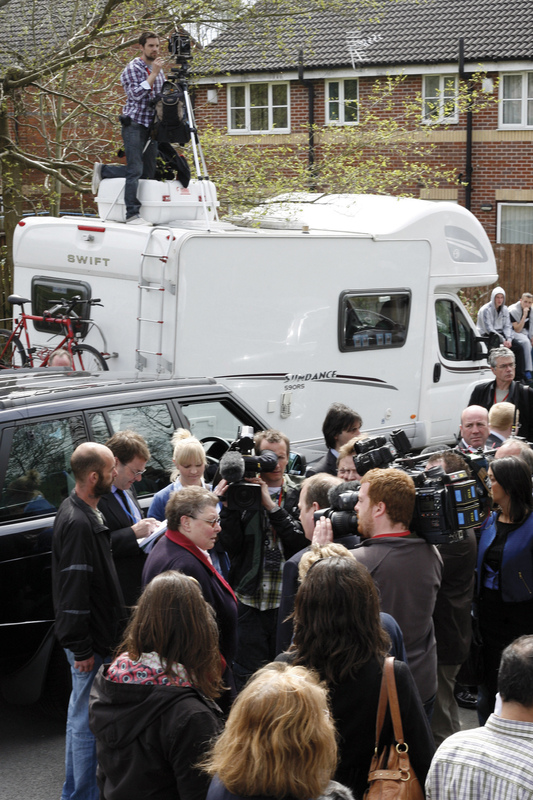 Surrey Mirror, “Photographer will put the Election in Focus,” March 25 2010, Evans, Owen. BBC News Online, “Photographer Simon Roberts is official election artist,” 20 March 2010. Yorkshire Post, “Exploring our Relationship with the English Landscape,” March 12 2010, Bond, Chris. Saturday Telegraph Review, “Voyage in Search of England,” March 06 2010, Davies, Lucy. Archive Magazine, “Envisioning the English Outdoors,” March 2010, Daniels, Stephen/ Kitchen, Ruth / Roberts, Simon. Royal Photographic Society Journal, “This is the Elusive Fellowship,” March 2010, Hallett, Michael. The Quarterly, “And Did Those Feet?” Spring 2010, Glasbey, Jo. Coutts News, “We English – Photo Inspiration,” Spring 2010. 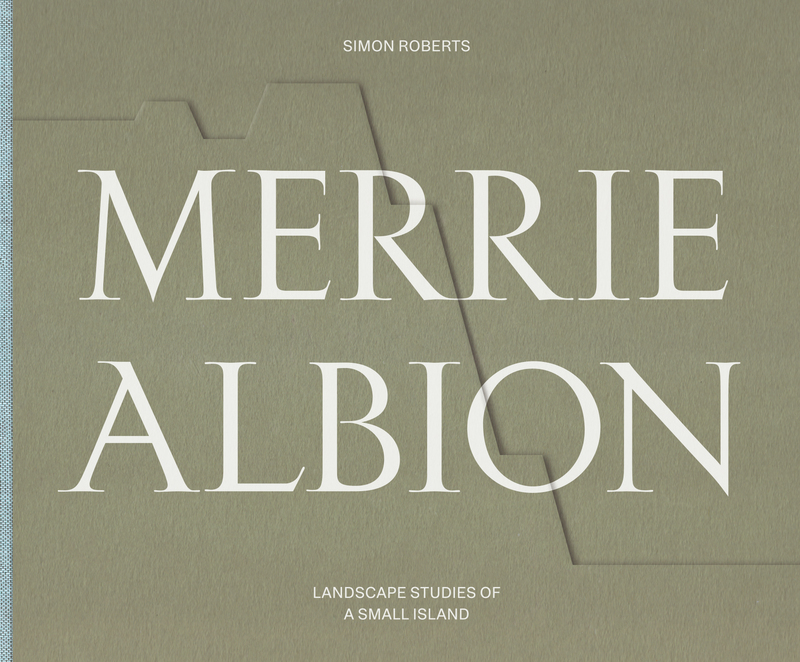 Albion Magazine, “Review of Simon Roberts’ We English,” Spring 2010, Betts, Alexander. The British Journal of Photography, “World Class – Review of World Press Photo,” February 24 2010, Smyth, Diane. The Art Book, “We English, Simon Roberts,” Volume 17/ Issue 1 – February 2010, Lane, Guy. Radio 2, “Claudia Winkleman Show,” Review of Polyarnye Nochi at Crane Kalman Gallery, January 15 2010, Steward, Sue. Radio 2, “Claudia Winkleman Show,” Review of We English, January 08 2010, Steward, Sue. an Magazine, “Season of Englishness,” December 2009/January 2010, Holley, Christine. The New Yorker, “Goings on about town,” October 26 2009, Aletti, Vince. New York Magazine, “Editor’s Pick: We English at Klompching Gallery,” October 05 2009. ARTmostfierce, “The Most Happening Shows in NYC” September 12 2009, Natal-San Miguel, Ruben. What’s the Jackanory?, “Mad dogs and Englishmen,” (Video interview), September 10 2009. American Suburb X, “Simon Roberts: Motherland,” November 2008, Rickard, Doug. Nahtstellen, “Simon Roberts’ Motherland,” 2008, Klomp Ching, Debra. Amateur Photographer, “Professionals Choice,” April 19 2008, Britton, Barney. Unseen – Museum of Contemporary Art, Shanghai, Exhibition catalogue, January 2008, Ho, Joyce. Departures, ‘The wild wild east,” October 2007, Chivers, C.J. The Guardian, “Simon Roberts’ Best Shot,” August 30 2007, Benedictus, Leo. Vogue, “Vogue Loves….Motherland,” March 2007, Trow, Mike. nb. When publishing any of the photographs, please credit the photographer named.